A Ferrari 458 racecar flies down pit lane, and I leap over the concrete wall separating me from the car. My pit-mate uses a pneumatic air jack system to raise the car. Another refuels the car. I remove a lug nut, then pull off a tire and replace it. I race to the other side of the car and replace a tire there. Less than fifteen seconds have elapsed, and the driver has already peeled away. It’s 2015, and I’m a pit technician. I’d been working on race cars for five years, and had spent six years before that racing performance motorcycles. In racing — whether that’s motorcycles or cars — there’s always something that’s outside of your control. There’s weather. There’s debris on the track. There’s other racers. Flash forward to now: at Phase Four, I design and build test thrusters for research and development. There’s still so much that’s outside of my control, but I love managing that risk and uncertainty. I’ve always been interested in figuring out and understanding how things work, and I’ve found here that I have the most fun learning just what I don’t know. Most of my job entails learning what not to do. To me, by far the most surprising aspect of our process is how often we build, test, and repeat. Today, I’m working with our chief technology officer, Umair Siddiqui, to set up the parameters for a thruster test. 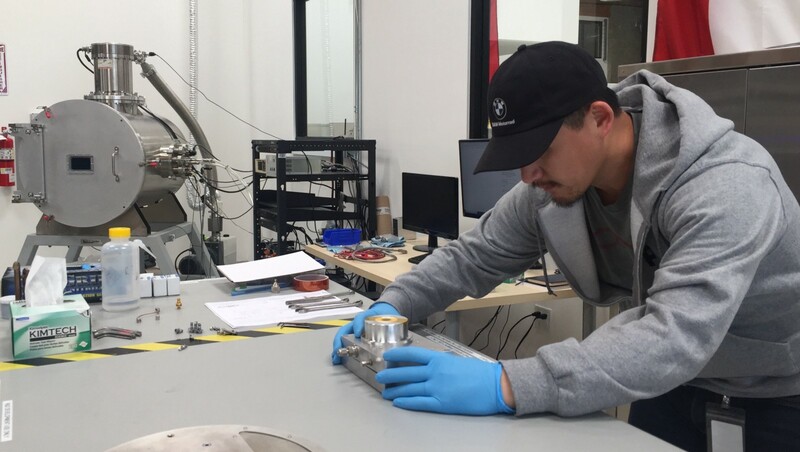 Chris Cretel, our propulsion engineer, models out the expected performance of today’s configuration, and I build our test thruster to meet the specifications we’ve set. I then attach the thruster to a test stand in our vacuum chamber. Our test stand is a beam — a seesaw of sorts. Then, I balance and recalibrate the test stand before we close the vacuum chamber and pump it down to mimic the vacuum of space. It’s like I’m back in the pit. I’ve spent hours preparing for this test set-up. I know what to check, what needs to be adjusted, what problems need to be addressed. And with hours before and after set-up spent venting and pumping our vacuum chamber down, plus a tight product development schedule, every minute is crucial. Every step is planned out, but open to improvisation. I’m accelerating into a turn at over 120 mph. I have my tools: the clutch, throttle, brakes, steering, and my own body. When I see my favorite rock on the side of the track, that’s when I know to simultaneously release the throttle, engage brake pressure, and stand up as 2 Gs press on me. Every step is planned out, but open to improvisation. The engine of the space economy.